Expect added intensity in the Civic's unique staging of Who's Afraid of Virginia Woolf? 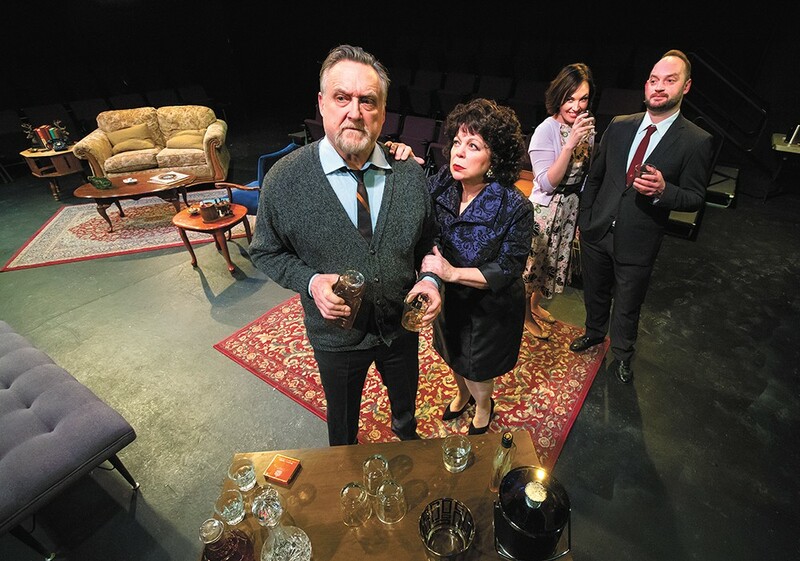 Thinking of theater in the same terms as spectator sports might not always stand up to scrutiny, but for a play like Who's Afraid of Virginia Woolf?, the reasoning is a little more sound. Although George and Martha, the middle-aged married couple at the center of Edward Albee's 1962 play, never land an actual punch, they subject one another to an unrelenting barrage of abuse, the goal of which appears to be to leave their adversary not just defeated but wholly, utterly broken. It's a sad, twisted game, even if its rules, somewhat crucially, are supposed to be known only to them. And like trained athletes, there's an art in the way that each of them plays that game. As might befit a professor of history — or, as Martha would insist, associate professor — at a respected college, George tends to more cerebral, using psychological setups and feints to catch his opponent off guard. His wife, on the other hand, is confrontational, with brute-force affronts designed to maim and humiliate. "She's pugilistic, all right," says Mary Starkey, "but it comes from deep anger, frustration and sadness. You know, I heard one time that men express deep sadness as anger, and women express deep anger as sadness. I think Martha responds in a lot of ways more like a man." Starkey is playing Martha in a new production of Who's Afraid of Virginia Woolf? in the Spokane Civic Theatre's downstairs studio space, where she'll appear opposite Jamie Flanery as George and alongside Danny Anderson and Emily Jones as the couple's unsuspecting guests, Nick and Honey. Directed by Troy Nickerson, this show will move into the round, which means that Martha and George's living room will be surrounded by the audience on all four sides. Like a boxing ring. "It should be pretty intense," Nickerson says. He's been working with experienced set designer Matt Egan to accommodate the unconventional arrangement. "It's just furniture in the middle, and I'm having a beamed ceiling that's just hanging free. And then there will be cutout archways, not even full arches, that will be hanging from the ceiling and go to different parts of the house. The front door won't even be a real door. It will be a cutout frame. It just puts you right in the middle of it. Now I can't even quite picture how I would have done it any other way." Being in the round calls for other changes too. Along with the slightly abstracted doorways, Nickerson says that a "light shift in how the actors are handled" is required as the actors perform for eyes on four planes instead of one. "You just learn how to play that space so that you give the audience the best perspective," says Starkey. "They're going to be there with us in the midst of this little party that we're throwing. I sort of dig it. I think you have to be conscious of the audience because they are so close in, but it's more the placement of your body in the space." As it turns out, the actors' onstage positioning, or blocking, wasn't the only subject of debate. During rehearsals, Starkey and Flanery sharply disagreed on the amount of blame their respective characters bear for an evening that proceeds from drunkenness to destruction to despair. "I remember at one rehearsal [Jamie] said to me, 'The fact that this evening falls to crap is all your fault.' And I said, 'Now hold on a second, buster. You start picking on me in front of the guests as soon as they walk in the door,'" says Starkey. "Arguing about who's really at fault, I just let them go at it a bit," Nickerson laughs. "Neither one of them wanted their characters to be to blame. I think it's good for them to battle that out on their own." Drawing parallels with the life and suicide of Virginia Woolf, she also came to the conclusion that the couple's shared frustrations stem from society's strict gender roles and their inability to fulfill those roles — to the point that they construct a "very sweet and very bizarre" fiction as the cornerstone for their relationship, a fiction that George is ultimately compelled to destroy. The original print version of this article was headlined "Kill Your Darlings"